Eugene Monroe has been a long advocate of medical marijuana access for NFL players. While the NFL still prohibits the use of any form of Marijuana, NFL Players look to change the perception and advocate for the use of medical marijuana. Many NFL players undergo harsh, sometimes debilitating, injuries playing the game of football. Common methods of treatment for these injuries include powerful, addictive medications such as opioids. 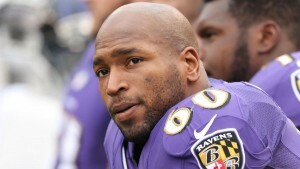 Eugene Monroe, a former Baltimore Raven, is not alone in advocating for the use of medical marijuana in the NFL. Other former notable players such as Kyle Turley and long-time advocate, Ricky Williams, have also been very vocal in proposing the use of medical marijuana within the NFL. Commissioner Roger Goodell claims that there is not enough evidence yet to support the leagues stance on medical marijuana. The NFL will continue to entertain the idea, but no further actions have taken place to see this idea come to fruition.